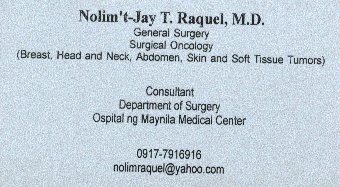 On December 19, 2002, at the Audiovisual Room of the Ospital ng Maynila Medical Center (OMMC), a historic affair occurred. The affair was a gathering of staff from the Department of Surgery, Department of Anesthesia, and Surgical Nurses of OMMC. The hospital administration officials and other guests from other departments within OMMC were invited to witness the 3 events-in-1 gathering. The 3 events consisted of thanksgiving celebration, graduation rites, and Christmas party. The affair was historic in the sense that it was the first time in the history of OMMC that a joint OMMC Department of Surgery and Department of Anesthesia Graduation Ceremony was held. It was also the first time that the Department of Surgery, Department of Anesthesia, and the Surgical Nurses had a joint Christmas Party. The affair was originally scheduled at 5:00 p.m. with the graduation ceremony as the first number in the program. However, with the Hospital Director unable to come on time, the program had to be changed with dinner at 6:30 p.m. followed by some games and funs while waiting for the Hospital Director. The graduation ceremony started at about 9:00 p.m. and ended at about 10:30 p.m. Dances and raffle followed and the affair ended a little passed 12:00 midnight.